You know how people say you can tell a woman's mood by what she's wearing? I've decided that theory also holds true with furniture. I've come to the realization that I paint my mood. So, seeing as Summer finally decided to grace Chicago with its presence (nothing like holding out until the end of July!) it goes without saying that my mood has been 'easy breezy' and loving life! Think flowy maxi-dresses and wavy beach hair. That's the look I've been channeling these days, and it's been reflected in my work as well. Good thing I got out of Finance...I don't know how my 'beach hippy' mentality would have mixed with quarter-end close! I found this dresser on Craigslist. I really couldn't believe I was able to snag it before anyone else. It was in great condition and has amazing curves. Here is the 'Before' picture. I almost felt guilty at the thought of painting over this beauty. I contemplated several different options of incorporating in some of the wood, but ultimately decided to go for my standard stained top-painted base combo (old habits die hard I guess). Here is how the dresser turned out. The top had some scratches and needed some work. I first sanded it down to its raw wood. If you've been following me for awhile now, you know it's no secret of my love for Jacobean stain. I tend to use it on EVERYTHING. Even if I start with a different stain, I almost always break down and put a coat of Jacobean over the top. NOT. THIS. TIME. I was going for an airy coastal feel, so I opted for Classic Gray by Minwax. It gave the top a soft, weathered look. One tip when staining - after you finish sanding, be sure to wipe down the surface with a damp cloth. This step accomplishes two things. First, it removes any debris and dust. It also helps to open up the pores of the wood, allowing the stain to soak in deeper. I painted the base in Annie Sloan's Old White. It's such a great basic color and never lets me down. When it came to distressing this piece, I didn't hold back. Maybe I was still feeling a tinge bit guilty for painting over such great Oak, and decided I'd let a bit more than usual show through. Whatever it was, I think it was a good choice. The distressing really helps to give the piece some contrast. If you remember those fabulous dresser pulls from the blue antique dresser that I wasn't able to use, well they're back and ready to make their debut! Since there were only four pulls on this dresser, I swapped out the original hardware for those carved wooden pulls. I absolutely love them! They really grab your attention and although I painted them the same color as the base, the details make them stand out. Can we just go ahead and hashtag them #showstopper?! For the top drawers, I went with clear cut glass knobs from D Lawless Hardware. Their simplicity and elegance really compliment the pulls. One of my favorite features of this dresser is the ladder detailing on the sides. Okay fine, maybe my favorite feature is that fur ball curled up next to the dresser. That's Emmy, the newest member of our family. More details to come on her soon! I haven't decided what I'm going to do with this piece yet. I usually don't get too emotionally attached to my work, however I'm a bit smitten with this piece. I've even scoped out the perfect spot in one of our guest bedrooms for this dresser, so I may just have to keep this one for myself...you know...strictly for my mental health. 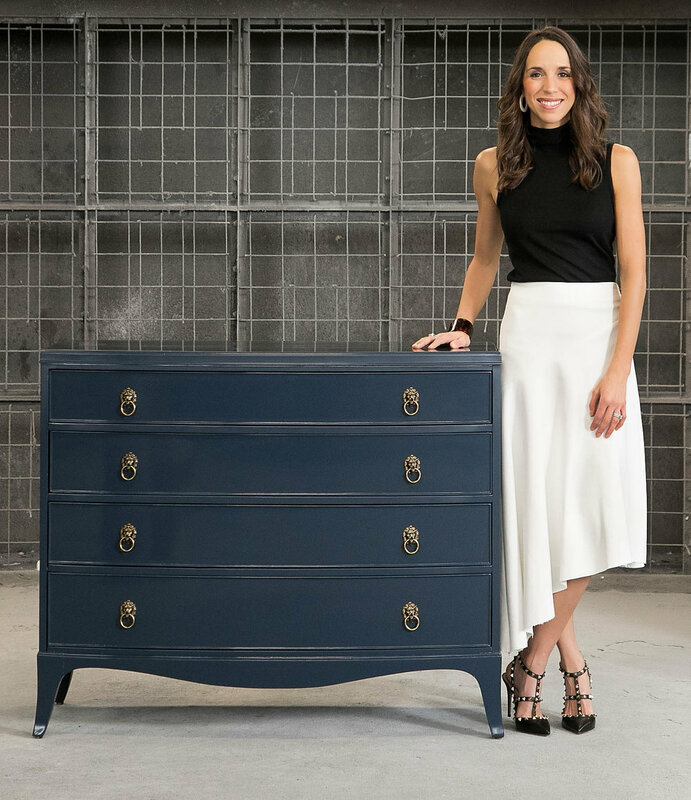 When that brutal Chicago Winter sneaks up on us in a few short months, I'll need some sort of coastal escape and this dresser may just be my cure!